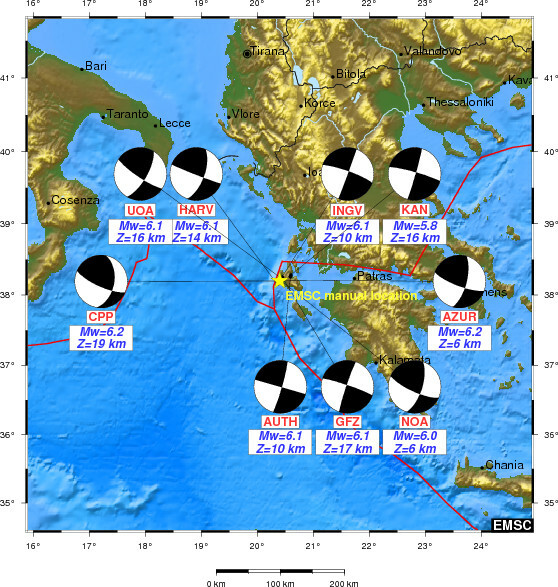 Two earthquakes of magnitude M6+ occured near the island of Kefalonia in Western Greece on 26 January and 3 February, 2014. Both were shallow strike slip events that are associated with the Kefalonia transform fault and caused not only damages to buildings and infrastructure, but also significant earthquake environmental effects (EEEs). Here I compile some photo and video sources from rockfalls and other features. Moment tensor solutions from the main shock on 26 January (source: EMSC). On Facebook, don’t miss the image gallery of e-Kefalonia.net. Evelpidou Niki also has great images. The most spectacular image gallery on rockfalls can maybe found at zougla.gr. There are massive landslides and rockfalls at the coast and inland. One harbour apparently has suffered lateral spreading and ground cracks are present at various sites. In 1953, a seismic sequence with three major events happened between 9 and 12 August. These quakes had magnitudes of 6.4, 6.8 and 7.2. Hundreds of people died and the island became almost completely devastated. This event lead to significant coastal uplift (Stiros et al., 1994). Paleotsunami research found that many tsunamis hit the neighbouring Lefkada in the past, too (e.g., Vött et al., 2009). Stiros, S.C., Pirazzoli, P.A., Laborel, J. and Laborel-Deguen, F., 1994. The 1953 earthquake in Cephalonia (Western Hellenic Arc): coastal uplift and halotectonic faulting. Geophysical Journal International 117 (3), 834–849. Vött, A., Brückner, H., Brockmüller, S., Handl, M., May, S.M., Gaki-Papanastassiou, K., Herd, R., Lang, F., Maroukian, H., Nelle, O. and Papanastassiou, D. 2009. Traces of Holocene tsunamis across the Sound of Lefkada, NW Greece. Global and Planetary Change 66, 112–128. Great, I look forward to seeing the results! Did you meet with the EERI guys?